Anthem is now available to everyone on PS4, Xbox One, and PC, so EA's laid out a roadmap for what to expect in the coming months. Act 01 of Anthem's post-launch content, titled "Echoes of Reality," is officially underway, with the plans for the next few months outlined on EA's official Acts page. There's a lot of cryptic teasing going on, with many nodes listed under a vague 'Cortex Locked' stamp that implies you'll need to come back later, but the big announcement here is the confirmation that Anthem will be getting its first world-changing Cataclysm event this May. This is a much, much more granular look compared to the initial Anthem roadmap, listing everything from individual Freeplay events to such evocative additions as "new items." But there are definitely some highlights to call out here, even before we get to May's opening cataclysm. In March, Freelancers can take on the first in a series of Legendary Missions, which will no doubt offer coveted rewards to make your Javelin the best it can be. Come April, a Mastery system will be added which will likely further specialize your build, and a new Stronghold dungeon called The Sunken will make its debut. April is also when the social elements of Anthem kick into full gear. It'll bring us guilds, leaderboards, and weekly stronghold challenges that'll no doubt require tight coordination and communication. Then in May, there's the grand debut of Cataclysms, Anthem's big endgame events that will act as limited-time, world-altering touchstones. 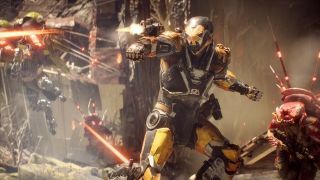 Discussing Anthem's endgame, executive producer Mark Darrah told us that Cataclysms are "designed to be content that you engage with for weeks... they're more meta-changing [and] they're designed to be more seasonal." Throughout Act 01, you can expect regular improvements in between all the big to-dos. The "Recurring Updates" section lists quality-of-life adjustments, bug fixes, weekly Coin bonuses via the (somewhat convoluted) teamplay Alliance system, additional goodies for sale at Prospero's shop, and challenges of the daily, weekly, and monthly varieties. The whole Acts page is laid out in a way that suggests we'll be getting new reveals quite frequently, and you can safely expect Act 02 to launch later this fall after the world recovers from whatever catastrophe takes place during the first Cataclysm. Speaking of 2019 plans, Fallout 76's new roadmap reveals prestiging, Nuclear Winter mode, and more all coming this year.